You are here: Home / BLOG / Animals / Back Home. A Status Report. Back in Basel. Arrived at the Airport. I see my mum and two wonderful friends waiting for me at the “Arrivals”. I am totally overwhelmed. It is so very nice to see them again and give them all a big, very long hug. “Oh so good to see you all!”. I am so happy that you all came out here, in the middle of the night, to pick me up. That is the nicest thing you can do for me at the moment. I am spending my first night at my mum’s place. I am going back home to my own flat today and try to adjust. I try to adjust for quite a while now. When I go out into town, I am wearing earplugs. I can’t stand all these noises, and people. 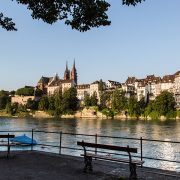 Of course, Basel is a nice city, and not even a particularly loud one. But it is all just too overwhelming. It seems to take me an awful long time to get rid of my Jetlag. Is this normal? Maybe there is more to it than just Jetlag? Maybe it is some sort of “deprivation”? Seems all I do at the moment is to sleep a lot at odd hours and being awake a lot at odd hours. Well, it is time to face the truth and step on my scale. I lost 13.5 kg (29 pounds) on the PCT. So the mission now is to DEFINITELY try to keep it that way! That’s it. It is that simple. So my friend Dunja will drag me to all these sport classes. She will help me to try them all out. The ones I can sort of see myself perhaps sticking to, I will, well, try to stick to, on a weekly basis. Today we will try Hata Yoga. That’s an easy start. Lots of breathing and easy movements. OK, that’s done. It was nice. Check. I subscribed. Tomorrow we will do Power Yoga. OK, that’s done too. Uhm, I think I stick with Hata Yoga for the moment. Now the next one is BodyToning. Holy smokes! That was something! Everything hurts big time now! Have you guys ever tried BodyToning? It is super exhausting! It is supposed to be a strength training for the whole body. And that is exactly how it feels like. I am so very sore now! I can hardly sit down, let alone get up. The lesson was one hour. I did sweat like a pig as of minute four. Remember what I had learned on the PCT? So I penciled myself in. BodyToning, every Tuesday. Check. I will keep you all posted about how my new fitness life goes. I am so not a sporty person. I am the sort of person who pays CHF 1000 plus for a Fitness Abo… and then hardly ever goes! I can hardly bring myself to bloody drag myself into there. So but now perhaps things are a little different! Now that I have hiked the PCT! Now I can do anything! Well, there is only one way to find out! So it seems my PTD (Post Trail Depression) never really kicked in! Yes, I do miss being out there on the PCT tremendously. I miss being outdoors every day, being in nature every day. Hike every day. To sleep in my Big Agnes. Wake up in the morning, pack up and go. Oh I miss that. And I miss seeing these cute little critters every day, I miss the fresh air, the trees, the mountains, the landscape, the views (oh the views! ), the excitement, and awe. I miss hiking, I miss the crunching sound my boots made on the trail, (crunch – crunch, crunch – crunch, crunch-crunch, it is still so much in my ears). I miss the tiredness in the evening, I miss being super hot and super cold during the course of just one day, I miss swimming in lakes with my clothes on, I miss arriving at a stream to filter my water. I miss the fresh air, the quietness (oh it was so so wonderfully quiet! ), the healthy-ness of the life out there. (Seems even the two Snickers per day could not do me much harm..). I miss Felix’s big smile and his wisdom. I miss chatting to other hikers along the way. I miss the routine of pitching my tent (! ), blowing up the mattress, chucking my sleeping bag into the tent, boiling water in my little stove for the freeze dried dinners, eating, and then going to sleep. I even miss getting out of the tent at 2am for my nightly poo while looking at the stars. And there is lots more I miss. Lots more. But I have to say, it seems I came back with my batteries fully charged up. I am filled with gratitude, and a weird feeling of, hm, how can I describe this: “satisfaction” perhaps? 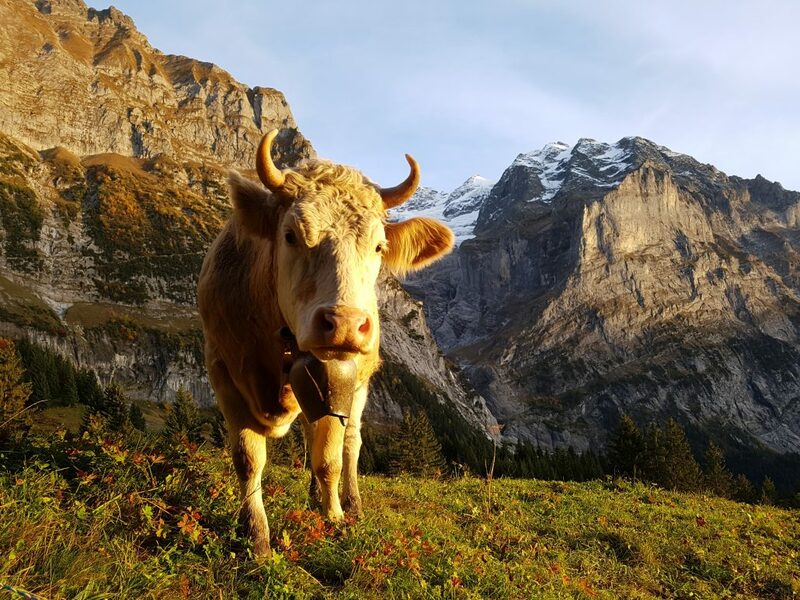 I went hiking with Tim in the Bernese Oberland. That was nice! It’s beautiful here too! And Swiss cows are so pretty! Probably perhaps prettier than US cows? Ha! Oh dear, guess my language on the blog was a bit questionable! Today, I am going to meet Steffi for lunch. Do you remember Steffi? We met at Scout & Frodo, the Trailangels in San Diego. We hiked together for a while (until I had to pause for a week because my feet where shredded). “Hi there Steffi!” Oh wow, so nice to see you again! 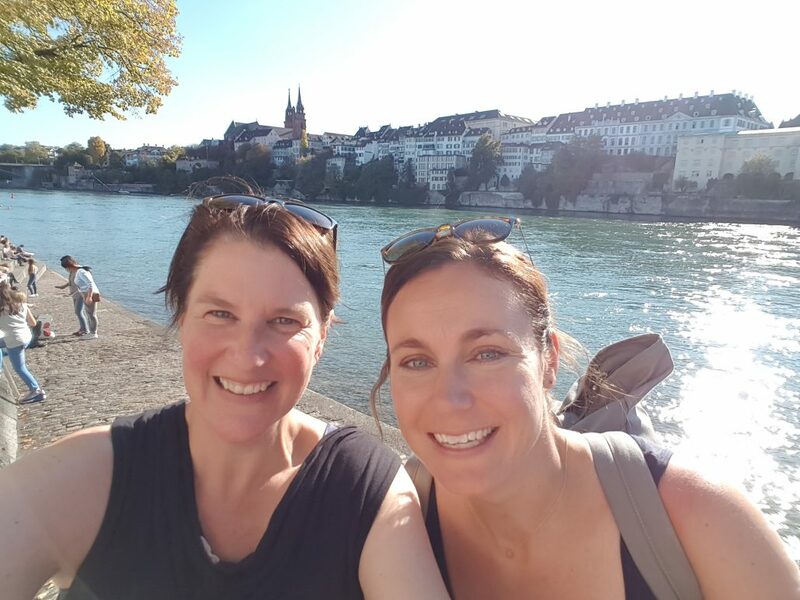 We chat all afternoon and stroll through Basel. It is so summery today! So nice to walk along the river Rhein. So yes. It is good here too. It is something profound. Something I learned on the PCT. My appointment for the puncturing is soon! So yes. I am doing well. Hi Sandy! Das eine schliesst das andere ja nicht aus!! 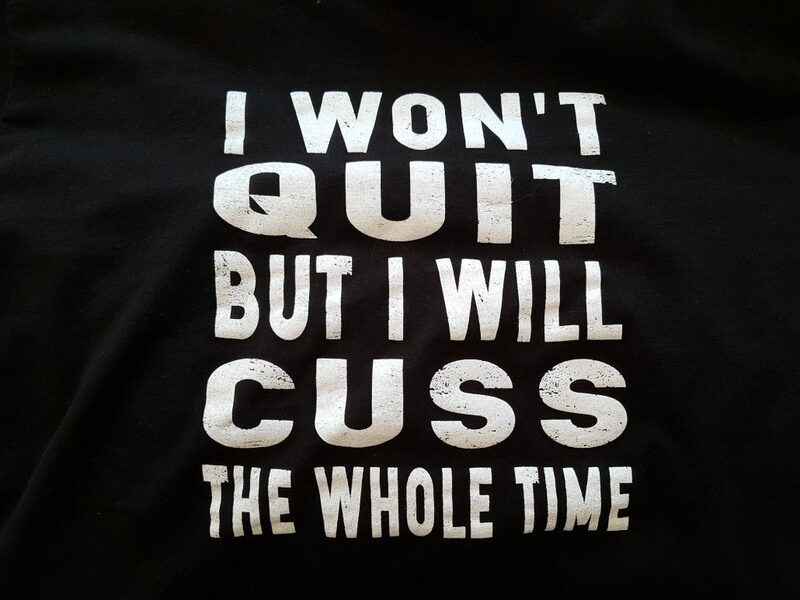 :-D Bin determined! Ich freue mich riesig auf unser OutbackCrossFit!! Das ist vielleicht auch eine Marktlücke!! :-D – Bis bald!!! Congrats, Heidi! I always so hoped you would make it and I will miss reading your blog. Just awesome what you achieved – agree, you do not need one of those fitnessclub abos! Real world hiking is much better, gives you better adventures to tell and memories for a lifetime, anyway. 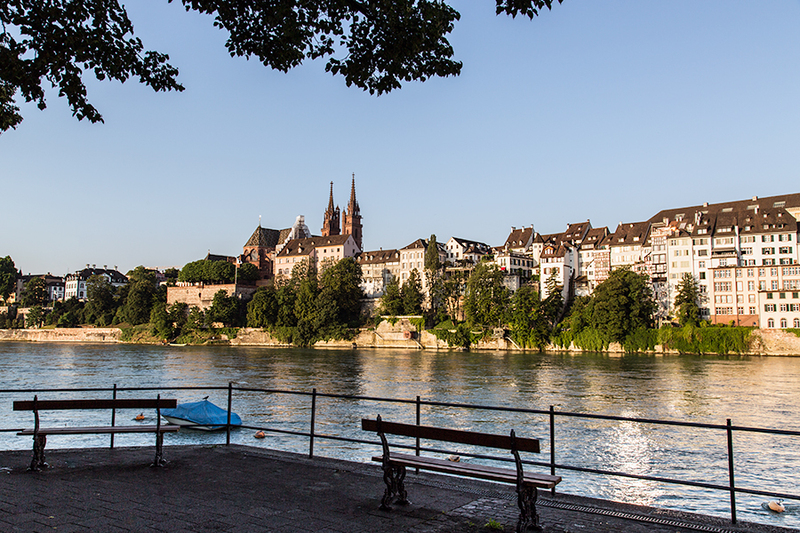 Enjoy being back home- z’Basel. I enjoyed your blog and was sorry when you finished. It’s nice to here how you are doing now that you’re home. Hi Linda! :-D Thank you! That’s inspiring! I’m a grown man, but I almost cried a litte. Beautiful writing. I can definitely understand your cravings (although never lived something similar to your grand experience). Welcome back to your life and to your new appreciation of it! Ich melde mich bei Dir Marlise! Ich plane den Trail auch einmal zu wandern . Jetzt hast du mich aber etwas geschockt mit der Ausssage, dass du 13,5 kg verloren hast in der Zeit auf dem Trail.Ich wüsste gar nicht, wo ich die bei meiner Figur noch über hätte. Sollte das bedeuten , ich müsste mir vor dem Start meines Hikes noch richtig Gewicht anfuttern? Liebe Heidi, vielen Dank für die schnelle Antwort. Damit hast du mich schon sehr beruhigt. Da ich von Natur aus eher muskulös bin und beruflich körperlich arbeite , dürften wohl genug Muskeln vorhanden sein. Hello Heidi, We are still in Greece. However, when I saw that cow picture I longed to be back in Switzerland. You lost 29 pounds, that is amazing …. but then so is hiking the PCT …. an experience you will never forget. You are very strong!! Take care and keep in touch. Also, say hello to Tim & Walter. And a very special thank you for sharing your blog with us.